Retail Insights: Does the growth in on-line retailing spell doom for downtown? And what can you do about it? Last year e-commerce sales hit $343 billion – that is triple the figure it was just ten years ago. Upon hearing this, many cities and towns across the country have started scrambling to address the issue. But like most complicated issues, the challenge from e-commerce is more nuanced than that $343 billion dollar figure suggests. 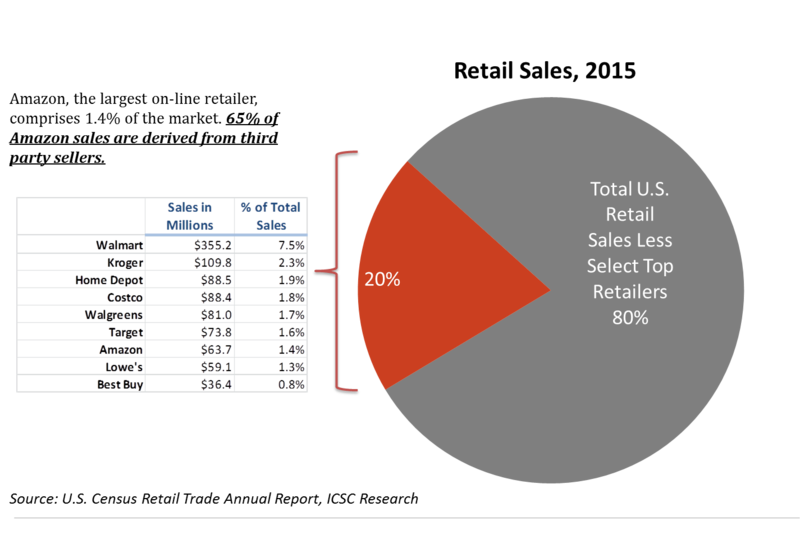 For example, Amazon.com, the largest on-line retailer in the market, comprises a mere 1.4% of all retail sales. And according to a report by Mckinsey & Co., only 35% of Amazon’s customers transactions are fulfilled by Amazon itself. That means that the balance, or 65% of all Amazon sales are derived from third party sellers. Another issue with the figures is that they reflect sales from BOTH pure-play Internet retailers AND bricks-and-mortar retailers who are selling on-line. When we dig further, pure-play Internet sales likely represent only about 3% of total sales, according to a report by the International Council of Shopping Centers. This does not mean that our Main Street businesses are out of the woods. Mckinsey estimates that some retailers will see a decline in in-store sales by 5-7% a year. Others in the industry suggest the impact will be as high as 10-15% of sales. For a small business, really for any business, that is the difference between paying rent and shutting down. Businesses will also face pressure from shoppers who can quickly and easily compare prices – often while they are in the store – and elect to spend their dollars elsewhere if they find a better price. But the cards are not all stacked against smaller merchants. High-touch items (like apparel) and experiential activities (like dining), continue to drive customers to physical stores. And a shopper that is in a store is much more likely to purchase something – even at a slightly higher price point – because the inconvenience and time cost associated with going elsewhere may not be worth it. So, are customers changing the way they shop? Absolutely. Will there by casualties among brick and mortar retailers who don’t keep up? Without a doubt (see Sports Authority and Aeropostale). But the line between virtual and actual stores will become blurrier over time, not more divided. Experts suggest that E-tailers are outgrowing their digital footprint and seeking space in the real world because they know that giving customers the opportunity to see and touch merchandise is critical to sales. Consider Modcloth, a on-line only retailer who recently opened a store in Pioneer Place in Portland, Oregon. Or Fabletics, Blue Nile, Birchbox, Amazon, Bonobos, Warby Parker, Peleton, etc…all of which have opened physical stores. This doesn’t always mean they sign long-term leases for traditional retail space – in some cases kiosks or pop-up stores help bridge the gap between an on-line seller and a brick and mortar presence. Amazon, for instance, has set up 16 pop-up shops around the country that allow people to test products and services and has indicated plan to open as many as 400 brick-and-mortar stores. According to GGP CEO Sandeep Mathrani, 60% of venture capital money being raised today is focused on bricks-and-mortar store. Another opportunity is the potential reduction of physical square footage necessary for traditional big-box retailers. Consider Target’s aggressive growth of the “CityTarget” brand. Customers can purchase from Target and arrange for store pickup – effectively making the target a fulfillment center/warehouse right in the middle of the commercial district. Consider Target’s new store planned for Central Square in Cambridge, MA. It will consist of a mere 21,000 sf of space on two levels (paltry compared to the average target store of 135,000 sf). As e-commerce grows, small businesses will need to get in on the action. Businesses looking to participate in the on-line sales game have a few options. In a previous post, we described a few ways in which businesses can sell through established venues (like Etsy or Amazon) as well as a few tools that allow them to create their own websites. BID’s and City’s can help support the growth on omni-channel selling by providing training and technical assistance to businesses. Local businesses are already in the community, and with some investment in delivery, can serve as mini-fulfillment centers as well. The benefit is that if something goes wrong, the customer knows precisely where to go and who to talk to to remedy a situation. Putting a website up cannot be the end all be all. Without clever marketing, especially on on-line platforms and social media sites, efforts to sell on-line can fall flat without the right follow through. This is where many businesses falter – they may not have the staff or resources to maintain and build an on-line presence. Many small business owners are just trying to run their business. We posit that this is where a supportive organization – like a BID or Chamber – can be extremely helpful, but pooling together resources and launching marketing campaigns that draw attention to businesses that are selling on-line. They can also enlist local colleges – a business school marketing class, for instance – can be a great opportunity for businesses to get help they need from savvy young people looking for real world experience and the social media know how necessary to build on-line awareness of the website. As we have written about before, (see How can downtown remain competitive in the face of online shopping?) malls are increasingly looking to round out retail offerings with experiential activities – things that, you guessed it, cannot be accomplished on-line. The Palisades Mall, a super-regional mall outside of New York City has built a ropes course in what used to be an open atrium. In this time of rapidly evolving shopping habits, small businesses are being challenged. Those that succeed will be the ones that continue to embrace new ways to meet customer needs through high quality service, on-line purchasing options, and an unrivaled in person experience that allows a shopper to touch and feel the merchandise. The goods news is that these are things that our downtown merchants are poised to offer in spades.